I recently received an email from Anita Flegg, author of ‘Hypoglycemia: the Other Sugar Disease’. Anita is a recognised expert in hypoglycemia and she disagrees with my view that it is best to eat only 3 meals a day (or possibly four) rather than eating 6 to 8 times a day. I think you are trying to extend what works for you — one person — to the whole world full of hypoglycemics. Besides, you don’t yet know whether this would prevent diabetes. This might work OK for people who don’t have crashes between meals, but I believe most people only know they are hypoglycemic because their blood sugar crashes between meals. I don’t want to give the impression that you should never eat snacks. If you are hungry between meals, then it’s fine to eat a snack. You are right that I am going mainly by my own experience although I know of many others who have also found the same thing, that they feel better with 3 meals a day plus maybe one snack in the afternoon rather than eating 6 to 8 times a day irrespective of whether they are hungry or not. If you eat a balanced meal with protein, fat and carbohydrate that digests slowly then it’s possible to keep stable blood sugar for 4 or 5 hours, no problem. The reason people get sugar crashes between meals is that they eat meals that digest quickly, with sugar and refined carbohydrates and not enough protein and fat. A low fat diet, for example, even with no sugar, used to make me get sugar crashes and I was continually needing snacks. Ultimately, you need to discover for yourself what works best for you. I’ve been following Chris’s suggestion of 3 good meals a day, as well as not restricting fats (eating *real* butter etc) for one month now and I am definitely seeing an improvement. 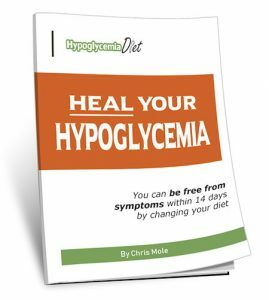 I used to have ‘hypos’ almost every day – some so bad and sudden that my blood sugar had dropped to 65 (measured), I broke out in a cold sweat, hands shaking etc. Horrible experience. I had been advised by a nutritionist to eat 6-8 small meals also, but for me it made my overall condition worse. Sure, it meant I could avoid a hypo so long as I ate something every 2-3 hours, but those times that I couldn’t I got hit. I felt I no reserves, like I was controller my sugar levels artificially with food instead of letting my liver do what it was designed to do. The more I used food as a crutch, the more the liver took a back seat and offered my body no support. After a month I can honestly say I have not had a severe ‘crash’ like I used to get 4 or 5 times a week. I can comfortably go 4 or 5 hours between meals; in fact if I have my dinner at 7:30pm I don’t eat again until breakfast, 12 or 13 hours later. I do occasionally feel my blood sugar is low, but those lows do not come on suddenly and are not as intense. I typically get moody, headache etc, but now instead of reaching for a snack I just stay calm and ride it out. After maybe an hour I start to come out of it, and I believe it is due to my liver finally responding to the call of duty and releasing glucogen or whatever its called. Years and years of snacking has made the liver sluggish, but slowly it is coming back to life and doing what it is meant to, ie, control blood glucose levels. I’m going to persevere with this as it is the only course of action which seems to offer real hope without drugs. I’d love to see a second book by Chris describing perhaps in more details some of the ups and downs of his journey, as I can relate completely to what he is saying. Thank you for the positive feedback. That is very encouraging for me to hear. I like your ideas. I’m just wondering as regards “snacking” what constitutes a snack? Is eating a small piece of cheese and cucumber while making kids sandwiches mid morning enough to rock the boat? Also I understand it is ideal to teach little ones to eat 3 meals but my 1 year old and 3 year old constantly want to snack is this alright for little ones? I’m not an expert on child nutrition but very young children will need to eat snacks. That doesn’t necessarily mean should you eat a snack every time you make something for your children. I tend to take a fairly basic approach to snacking. If you feel hungry, you should eat something. If you don’t feel hungry, you shouldn’t eat. If you eat balanced meals with enough protein, fat and carbohydrate you generally shouldn’t need to snack but there are times when you will not eat a balanced meal and will feel a low blood sugar attack between meals, in which case you should eat something. There’s nothing really wrong with eating a small piece of cheese and cucumber while making the kids’ sandwiches but it tends to create a habit of indiscriminate snacking, whether or not you really need the food. And that’s why a lot of mothers put on weight. I really appreciate for taking time to share your ideas to us. This is very helpful and very informative. I already shared this site to some of my friends and they are looking forward to reading your articles. Thanks for sharing this and more power to your site. I’ve been all over trying to find out what is going on with my body. I keep thinking I must just not have any willpower but what you are saying sounds exactly like me! I can’t wait to try this out and see if I can get to where I’m not constantly worried about finding something to eat. Thanks so much for the info. and the website! I became SEVERELY hypo the day after Thanksgiving last year. The past year has been a living h#ll for me. My mother came down with severe hypoglycemia when she was 10 years younger than me, and is now an insulin dependent diabetic after not taking care of her diet and weight. Anyway, my hypoglycemia is extremely brittle. I was vegan for 16 years and it’s been heartbreaking that I’ve had to go back to meat, cheese, and eggs…yet still have issues. Even if I eat a meal that “should” be perfect, I often feel sick afterwards. I cannot eat just 3 times a day. No way would it work for me. I have to eat every 3 hours, on average. And I’ve noticed that I become much more unstable at night. From dinnertime on…it’s hard for me to feel good. I thought it made no sense, but I am finding through a lot of Google-ing that there is a connection to your body’s circadian rhythm, the hypothalamus, and blood sugar control. I’ve been living with hypoglycemia for as long as I can remember and the only thing I am sure of is that things change. The amount of stress I am under definitely affects how my body reacts and how often I need to eat. I don’t always need a complete meal when I begin to feel headachey or spacey–sometimes just one bite of sugar, a couple nuts/something whole grain, and a bit of cheese/ham/turkey/ chicken will work. I have learned, however, that the 3-prong approach (instant sugar/ longer term carb/extended protein) will keep me balanced for a much longer time than just one quick bite. It can take a very long time to figure out what works for you–and then something changes and you’re back at Step 1. Be flexible. Thank you for sharing what has worked for you. 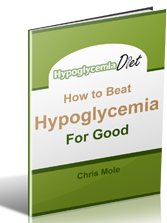 I have been struggling with hypoglycemia for years but only just recently hit rock bottom. I’m a mother of three under 12, with a husband who works out of town, was a business owner of a fitness studio and the instructor teaching all the classes along with personal training clients. I was spent!!! There were many warning signs but I just didn’t understand them, I had to keep going for my clients and kids with coffee etc. But one day my body literally said no more…stop! I started to have sever panic attacks after meals, in the middle of the night etc. I had a few visits from the paramedics, a few ER visits etc. I ended up closing my business and only focussing on my kids, but even that was a struggle. Chris I have researched and tried every style of eating and nothing helped. I actually got worse. I noticed the more frequently I ate the more horrible symptems I got. I became real sick 4 months ago, total hell! But the last 4 days I have been only eating 3 sensible meals a day and Im starting to feel so much better. I still have lows but I tap my liver and basically ask it to release some sugar, it takes a bit but I ride it out and feel much better. Thank you so much, I can now see the light at the end of the tunnel and a bright future ahead. Another thing which has worked is a steady practice of hot yoga. I’m always cold plus I’m forced to breath properly now and it’s a way I can detach from the disorder, I’m always thinking about it. Anyway thanks for all our wisdom, you are changing lives and your 3 meals a day program works! Chris, For many years I’d snack when I felt my blood sugar dropping, cheese and crackers, then lately bananas, dates, plain yogurt with maple syrup as well as meat protiens. I was eating bananas or dates every 2-3 hours, gaining weight, and still not feeling well. I had to do something different, thats when I found your website. Its been less than 1 week. I cut out all sugar, coffee and do drink a little hot tea with a splash of milk. I eat 20 grams of protein, 10 g. of fiber, (chia seeds, flax seeds and sunflower mixed in my whole grains) 15 g. of fat (seeds have good omega 3 fats, plus butter, olive oil), in balanced meals 3-4 times a day. I’m feeling balanced, stable and even have more energy. I think I’m losing weight and I’m thinking clearer than before. I will keep eating this way, its working for me. Thank you Chris, God Bless!